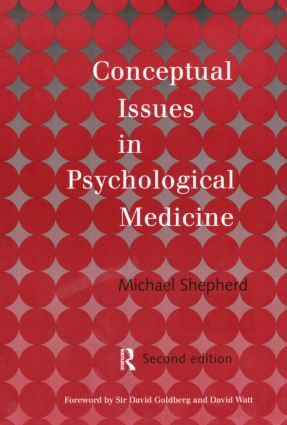 Conceptual Issues in Psychological Medicine is a collection of papers written by the celebrated psychiatrist, Michael Shepherd, who was one of the originators of psychiatric epidemiology in the UK and a leading social psychiatrist of his generation. He designed and implemented some of the first systematic studies into what are now widely recognised clinical syndromes. His extensive research experience and his advocacy of a scientific approach to social psychiatry form the basis of the essays contained in this book. Covering such issues as the development of research strategy and the difficulties involved in completing psychiatric studies, Shepherd's papers address many of the issues currently facing professionals in this field. He writes authoritatively and engagingly on clinical syndromes, the history of ideas and the use of the epidemiological approach in psychiatry. Conceptual Issues in Psychological Medicine stimulates and informs the reader in equal measure; it will be a welcome addition to the bookshelf of any practitioner of medicine. Michael Shepherd was Emeritus Professor of Epidemiological Psychiatry at the Institute of Psychiatry, London, and Editor of the international journal Psychological Medicine. He died in 1996.